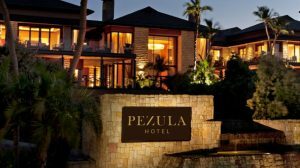 Soaring above the glittering Knysna lagoon and offering breathtaking mountain and ocean views, Pezula enjoys a setting that has to be seen to be believed. It nestles in its own golf estate on an exclusive cliff-top retreat. 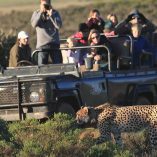 It is surrounded by an aromatic mantle of Cape coastal fynbos – bushes, trees and wild flowers teeming with birds. And it overlooks a nature reserve, while also encompassing the exquisite sheltered beach at nearby Noetzie. And that’s merely the setting. 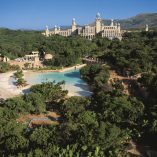 Inside this remarkable resort hotel, you’ll experience a welcome that’s as magical as our mountain air. In an atmosphere of unhurried calm, our staff members will cosset you with service and attention. You’ll enjoy the sensuous pampering of a health spa, gourmet meals lovingly prepared from the freshest local ingredients, and the delightful seclusion of your suite with its own private balcony. Invigorated by this care, you may choose to take advantage of Pezula’s extensive sport and recreation facilities, ranging from stunning nature walks to yachting, diving and much more. 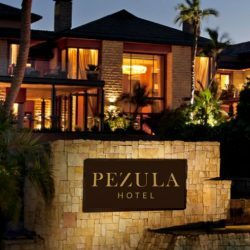 Pezula is the finest combination imaginable: secluded sophistication and breathtaking natural perfection. Here is the touch of heaven you’ve been longing for. 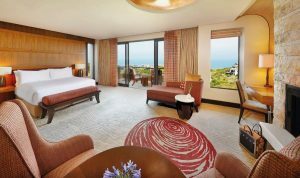 Each of the 82 magnificent suites (20 junior, 60 luxury and 2 executive) is a cocoon of comfort and sensuous seclusion. Luxuriate in a massage or aromatherapy session on your private balcony. Linger over a romantic dinner for two in your room, while you enjoy the warmth of a genuine log fire. Or put your feet up in front of the television – there are 24-hour satellite channels for your pleasure and relaxation. However you choose to spend your time, amenities such as an in-room refreshment centre and individual climate control ensure supreme comfort. 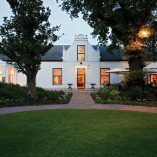 After a game of golf or a walk on a spectacular nature trail, here is the perfect haven to welcome you home, with all the style and luxury that epitomise this exceptional hotel. • Individual terraces, 24-hour satellite TV and computer. • Non-smoking suites and paraplegic suite available. • A health spa with indoor heated pool and fully equipped gymnasium. • Championship golf course with resident US PGA golf director. • Transport by limousine or shuttle provided to two nearby airports. • Pezula private jet and helicopter and helipad. • 24-hour doctor and dentist on call. The Health Spa offers customised facial and body treatments, and massage therapy. 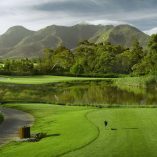 There’s a gym, indoor pool and access to all Pezula’s sporting facilities, while Knysna and its surrounds provide an abundance of outdoor activities. 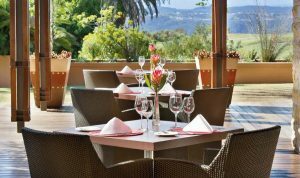 Cape Rock lobster, Knysna oysters and freshly caught line fish are but a few of the local delights prepared by our master chef and served throughout the day. He begins with the very finest and freshest local ingredients in season, insisting on organically grown produce. He then prepares each dish to bring out the full natural flavours and enhance succulence and tenderness. The result is a gourmet menu that is simple yet deeply satisfying, with each meal a unique occasion. 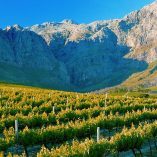 We take our wines no less seriously, and have collected some of the finest Cape and international vintages for your enjoyment. For a quiet pre-dinner aperitif or late-evening nightcap, our gentlemen’s bar with its wooden finishes and hospitable ambience is hard to beat. In winter, the warm glow of the fireplace makes friends of strangers, and many guests linger to soak up the cosy atmosphere. Equally congenial is the champagne and cigar bar, a firm favourite with many visitors. Prefer the privacy and romance of in-room dining? We would be delighted to offer you this service at any time of the day or night.